Attacks on vulnerabilities in web applications began appearing almost from the beginning of the World Wide Web, in the mid-1990s. Vulnerabilities in web applications are now the largest source of enterprise security attacks. Web application vulnerabilities accounted for over 55% of all vulnerabilities disclosed in 2010, according to an IBM X-Force study. That may be the tip of the iceberg as the study includes only commercial web applications. 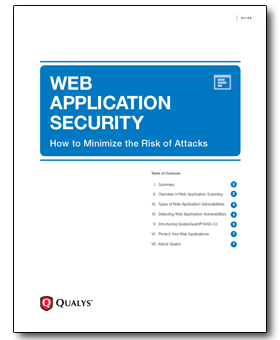 To help you understand how to minimize these risks, Qualys provides this guide as a primer to web application security. Download this free guide today!